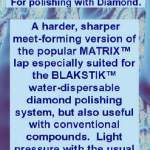 PRIMARY USE: Polishing with 50-200K diamond. SECONDARY USE: Prepolishing, fast and perfectly. 3K diamond is usually used. Last Few Years: People are using them to CUT. Will not load up or foul when cutting quartzes. The product that started it all here. 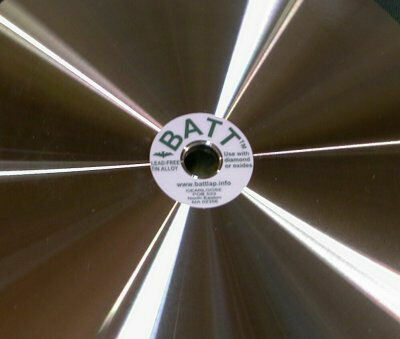 The BATT™ is the standard for tin alloy laps. With more than 8,000 sold, it has established itself in Commerce and Competition time and again. 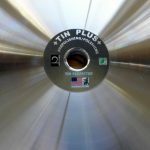 A SOLID cast tin alloy lap, with two usable sides, it still sells for significantly less than many commercial rolled tin laminated laps. A BATT™ lap charged with 3,000 diamond (Or 8,000) provides a perfect pre-polish after cutting with 600, with a surface good enough to allow subsequent polishing in record time, on stones from Fluorite to Sapphire. 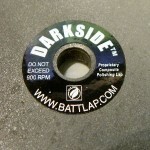 A BATT™ lap charged with 50K or finer, or an oxide/ Darkside for the quartzes, promptly finishes the stone.